Somewhere between the buttoned-up utility of the ThinkPad and the sleek efficiency of the IdeaPad sits an untapped sweet spot for affordable, entry-level notebooks. At least, that's clearly what Lenovo is banking on with their new ThinkPad Edge series. The ThinkPad Edge purports to be targeted towards small and medium-sized businesses, but it's just as easy to say that it's equally unfit for both casual users and serious professionals. While it's a perfectly capable machine in most respects and a decent buy for the money, it often feels like a compromise to an argument no one was having. The system we tested was loaded up with a 1.3 GHz Intel Core 2 Duo SU7300 ULV processor and Intel GS45 chipset, and 4GB (2x2GB) of DDR3 RAM (1066MHz). You can also customize up to 500 GB of HDD storage. That set-up will run you $899, while the $549 base model ships with either AMD's Turion (clocked at 1.6GHz) or Althon (1.5 GHz) dual core processor, 4GB (2x2GB) of DDR2 RAM (667MHz), and a 160GB HDD. The mash-up is clear the instant you unbox the Edge. The rounded corners and glossy black finish are reminiscent of the IdeaPad, but when combined with the ThinkPad-like flat display back, the 13.3" model I reviewed (14" and 15" models will be available in the spring) brings to mind a futuristic cafeteria tray. The reflective gloss is also a fingerprint trap, so expect a lot of smudges unless you're prepared to give your notebook regular wipe-downs. The 13.3", 720p (1366x768) screen offers better sharpness than you might expect from an entry-level rig. There's no latch to keep it closed, but it opens easily on its hinges. And my god is this thing flexible: I'm not sure why you'd ever want it to, but the display can recline over 180 degrees. Like the rest of the ThinkPad line, the Edge comes equipped with both a trackpad and a TrackPoint nub. The trackpad's multitouch capabilities are appreciated, but its narrowness and frenetic responses definitely aren't. As for the nub, I've never been a big fan, but it's integrated well with the keyboard and works just dandy, if you're into that kind of thing. Speaking of that keyboard: the island style that Lenovo has moved to for the Edge is a welcome design improvement over previous ThinkPad models. It's less industrial, more welcoming. The keys are raised and have some spring to them, and while they feel a bit blocky at times it's overall a smooth typing experience. The Edge also has the distinction of being a thin and light notebook that's not that thin (one inch, although the 6-cell battery in our test model adds another .5 inches in the rear) and not that light (3.6 lbs. with a 4-cell battery and about 4 lbs. with the 6-cell). But it's still portable enough that it wouldn't be cumbersome to take on all of those small and medium-sized business trips. The ports are distributed along the sides, as on the IdeaPad, and it's a decent array: three USB ports, VGA out, HDMI, and a multi-card reader to go along with your standard ethernet, microphone, and speaker jacks. Conspicuously absent is a DVD drive. The Edge's solution to potential design blemishes like speakers and the battery appears to be to sweep them under the rug. The speakers are placed on the notebook's underside, and offer decent—though at times tinny—sound quality. I actually love the battery solution: its placement underneath the rear of the computer creates a natural keyboard incline. This isn't a computer you're going to want to do intensive gaming on (thanks largely to the integrated graphics), but then again it's not supposed to be. To its credit, the Edge does handle streaming HD videos without a hitch for when you need a Muppets Bohemian Rhapsody fix at the office. As far as benchmarks, the Edge falls where you'd expect it to: somewhere between the IdeaPad U350 and the ThinkPad T400. A more appropriate comparison would be another 13" thin-and-light like the Asus UL30A, and our GeekBench testing indicates that the two are pretty evenly matched. Bottom line, you're not going to want to do much more with the ThinkPad Edge than get on the internet, send some emails, and bang out a few Excel spreadsheets. And that's what it's designed to do. Then again, so are netbooks. Here's where the Edge really delivers. Lenovo claims that the six-cell Intel model gets an impressive 7.8 hours of battery life. I tested our system with higher performance settings, medium screen brightness, Bluetooth off, and a page automatically reloading every 30 seconds on Firefox to simulate active web browsing. And that obviously can be further improved by settling for lower performance/higher battery life settings. 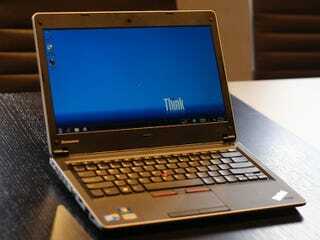 So what has Lenovo introduced to the world? A lot of not quite. It's a thin-and-light that's not quite either. It's a notebook that's not quite powerful enough for heavy lifting and not quite affordable enough for casual use. It has a contemporary design that's not quite, well, smudge-proof. And for all it does right, this new ThinkPad still strikes me as a computer with a target audience that's not quite identifiable. At its introductory price point, the Edge sounds like a competitive machine, but remember that you're also losing most of the things that distinguish it in the first place-the ULV Intel processor and the 6-cell battery, in particular. Honestly, if you're in the market for a new notebook, there's a good chance Lenovo already has something that fits exactly what you're looking for. And that it's called either IdeaPad or ThinkPad.